Groove Analogizer creates drum sounds from an audio input. 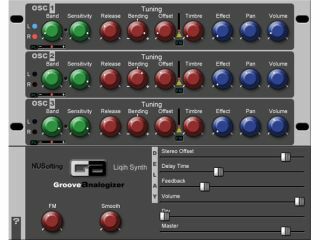 NUSofting´s Groove Analogizer is the latest plug-in to be re-released as freeware. Previously available for $29, it´s yours for nothing as of right now. Groove Analogizer is a drum synth with a difference: it´s triggered by an audio rather than a MIDI input. As such, it loads as an effect rather than an instrument. Three oscillators are onboard - each of which has left, right and left+right inputs - and these can be triggered and shaped by any kind of percussive sound, be it mono or stereo. The audio input can be a WAV file or another VST instrument. Other features include a band-pass filter that enables you to select which frequency range of the audio will do the triggering, and a pre-listening function so that you can monitor the triggering source. Groove Analogizer can be downloaded directly from the NUSofting website. It runs as a Windows VST plug-in.